2,310 km bicycle trip started in the capital Lisbon along the Atlantic coast northwards to Spain, via inland cycling Portugal´s highest point and all the way south to southeasternmost Portugal, along the Algarve and the southern Atlantic coast back to Lisbon. Do you like Cycling Portugal? Having landed at Lisbon airport, we hid our wheel cartons in the stairwell of an underground car park, hoping that in five weeks' time they might still be there. Then we started cycling towards the center of the capital. Along the banks of the Rio Tejo we pedal through the city traffic to the west and under the bridge of July 25 we slowly left the city center and drove on via Estoril to Cabo Raso, where we turned north the next morning. On some very beautiful road with a view over the sea we cycled to the westernmost point of Europe, the Cabo da Roca and then on the N247 with still very dense traffic further north over Ericeira and Praia de Santa Cruz, where we took a bath break on the beach , The slightly farther north Cabo Carvoeiro we left and drove instead forced on the IP6 in heavy traffic through Obidos and Caldas da Rainha, before we finally drove back on smaller road to Foz de Arelho back to the coast. In Nazaré we drove through crowded crowds due to bullfighting and further north there was finally a bit more nature and less city and traffic. So we rolled over little busy roads through pine forests, sometimes on very good roads, sometimes on pothole road to the north. Unfortunately, large parts of the forest had fallen victim to forest fires and so it went for some kilometers through burnt area. A campground we found easy in the evening. About Figueira da Foz we continued through dune landscapes without traffic northwards along miles of pristine beaches along. That did not change even north of Aveiro, after we had crossed with a small passenger boat on the peninsula northwest of Aveiro. No hotel buildings, no beach chairs, no people! If you wanted a whole coast for yourself, that was right! In some strong headwinds we cycled through beautiful small towns along lonely beaches along with surprisingly low traffic to Porto, where we drove along the banks of the Rio Douro into the city center. Along the beautiful promenade we drove to the famous three-storey bridge and then waived in the center but on a visit to one of the numerous port wineries, because we did not want to leave our bikes unattended. Across the lowest level of the bridge we reached the other side of the river, where we paused with a glass of port wine, before returning to the coast along the northern shore. On very small and winding roads, partly with jogging cobblestones, we went to Povoa de Varzim the next day and later on to Esposende, although better, but not particularly interesting route. Further north the landscape became more beautiful and a bit above the coast we cycled partly with beautiful views to Viana do Castelo, where we said goodbye to the sea, because here we wanted to turn inland. Along the Rio Lima we drove east in increasing heat, because there was not a cooling breeze from the sea for the time being. Passing through the beautiful town of Ponte de Lima, we continued northeastwards, steadily uphill, making it hot and exhausting and occasionally cooling off in one of the washhouses with springs that regularly found their way to the side of the road. We drove deeper into the National Park Peneda-Geres and then continue uphill and past reservoirs through rocky mountains on wild horses and bulls over the border to Spain. After a few kilometers downhill we turned south, climbed in steep, shadowless bends again a pass at 750 m and traveled back to Portugal at the Portela do Homem. After a swim in the very beautiful, but with visitors very overcrowded waterfalls, it went over the 855 downhill to 450 m. Shortly before the main road a shortcut on the map, which would save us a long dangling westward, but it should be a nasty drudgery, as we had to push the wheels strenuous on very steep roads uphill and reached the N103 after two hours. This we then continued strenuous uphill and downhill over 920 m altitude east to the large reservoir at Viado de Baixo, where we pitched our tent and spent the rest of the day swimming and sunbathing. We drove further east to Chaves, here relinquished time to travel to the extreme northeast of the country and thus turned off to the south. From now on, it should go south to the Algarve! On the N2 we cycled on only moderately uphill and downhill leading route, partly again through completely burned forests in heat to Vila Real. Further south we drove on beautiful route through vineyards and great panorama over Peso da Régua down to 70 m altitude and again exhausting and hot at 950 m via Lamego and Castro Daire. On the way south to Videu we went through valleys with many construction sites. A highway should soon span the valleys on monstrous bridges. It continued southeastward over Gouveia exhausting uphill and downhill, before we started the morning early in the morning with the drive of the highest mountain in Portugal, the Torre. With intermediate descents over several hundred vertical meters we climbed gradually the steeper road, past reservoirs and the only four ski lifts in Portugal, up to the highest point at 1,993 m altitude, over which the road also smooth. Heading towards Covilha, it then descended through bizarre rocky landscapes to 1,400 m, where we set up our tent for a cold night and for the first and only time on this trip really needed our sleeping bags. For reasons of time, we decided to shorten our route to the south in Covilha something, because in order to avoid the highway, we would have had to go in zigzags to the south in major detours. Actually, a bike ride was not possible, but we managed it with some penetrance and smile thanks to friendly railway officials then. Of course, there was no tariff for the bikes, so we could even take them for free! 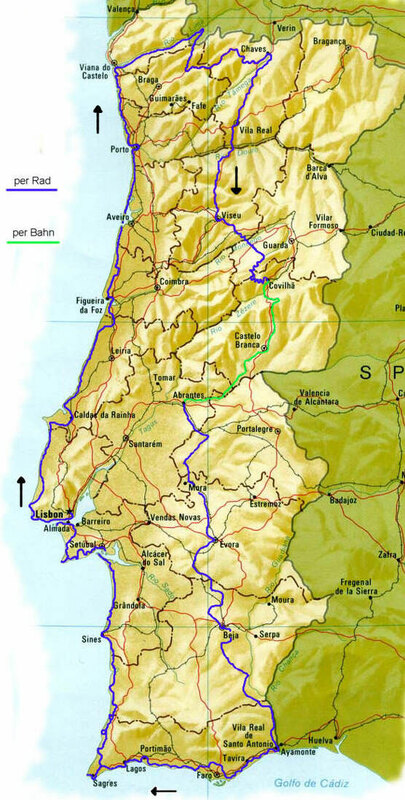 On a beautiful route, it went through the Portuguese interior southward, later along the Rio Tejo, which could be seen only from the train or boat, to Abrantes. South of Abrantes we cycled through a much flatter landscape, the wind was stronger and so we pedal in increasing gusts past fields and pastures, until an unfortunate chain of gusts of wind, oncoming traffic, overtaking truck and at a short distance brought us down the roadside! Luckily, nothing serious happened! Terror and grazes were soon forgotten. A little more cautiously, we cycled on and crossed the border to the Alentejo, the land of cork oak forests. Through olive groves and past cork oaks, we headed south over Évora and then more monotonously along endless fields, cork oak and eucalyptus forests along and through more and more Arabian villages to Beja. On a side road and through endless fields we went via Salvada to the N122 and on this further south in the Parque Natural do Vale do Guadiana over bizarre hills on a very beautiful route. The place Mértola we passed on the European day of car-free traffic and so we enjoyed a completely traffic and exhaust-free Ortsdurchquerung! A little further south, we turned east again and drove to Alcoutim on the border river Rio Guadiana, where we let our eyes glide over to Spain. We followed the river from here always south on a very beautiful route, but in great heat. At Foz de Odeleite the road left the river again and after a steep climb and a hilly ride through beautiful steppe landscape we finally reached the sea after eleven days. We were in the Algarve! In Vila Real de Santo António, in the southeast of Portugal, on the border with Spain, we stocked up our supplies in a supermarket and headed west. With unfortunately a lot of traffic, we passed the hotel castles of Monte Gordo and numerous other built coastal towns, always on the side of the main road, which we could not leave for lack of alternative. Sure, there might be many beautiful bays on the way, but they were not accessible to us because we could not leave the bikes unattended on top of the cliff at the beginning of a long staircase. From the road, the ocean was rarely seen and so it went to Faro by scenic route not very attractive. In order to avoid the even worse traffic in Faro, we turned north in Olhao, but a major construction site for the stadium for the European Football Championship next year seemed to want to destroy our plan. We wandered over the huge construction site area for a while and finally found a way out. Some time later, we pitched our tent in Quarteira on a campsite by the sea and went for a swim. As far as Albufeira, there was not much change in the rather undeveloped landscape, at least not at the one we could reach. In a souvenir shop, we asked the friendly shopkeeper, which beaches in the Algarve because for us easily accessible and still as original as possible and not so crowded. So we cycled afterwards to the Praia de Senora da Rocha, where we park our bikes within sight of the beach blanket and thus could finally enjoy the beach life of the Algarve. Through a tunnel we reached the even lonelier neighboring bay. We cycled on to Praia da Marinha and then continued uphill and downhill, sometimes quite steep, to the west. About Portimao and Lagos with its beautiful promenade at the port we drove to Praia da Ana and on to Cap Ponte da Piedade, where we then turned off the wheels and the rocky coast on foot explored. In Praia do Porto de Mós we were able to ride our bikes back to the beach before continuing on to Burgau and Forte de Almádena. After Burgau, the landscape was finally not once again built, but who knew how long it would take, until it would look like here further east ... So we pedal over scenic route to Cabo de Sao Vicente, Portugal's southwestern point. From here it should go back north. We drove back to Vila do Bispo and then followed the N268 north. Unfortunately, the sea was close, but rarely seen from the road. Therefore, we turned off at Carrapateira on a small gravel road, which led on as a Rüttelpiste on top of the cliffs along the sea and thus offered a much nicer view. After Vale da Telha but then again only the main road and so we drove on Aljezur on the N120 further north. In Odeceixe we turned again to the beach, where the first rainy rain fell for a long time. Unfortunately, it rained on the way further north now more often. So we interrupted the way every now and then to Unterstellen. We stayed close to the coast via the Cabo Sardao, but were hit by a thunderstorm in one night, causing us a sleepless night of lightning, torrential rains and gale-force winds, so we were afraid for our tent because the herring were directly in the sand the cliff did not stop. Only in the early morning the storm subsided and we found some sleep. Via Almograve, Vila Nova de Milfontes and Porto Covo we continued northwards to Sines and then monotonously over the side lane of a freeway to Costa de Santo André. On a later smaller road it was with stronger headwind to the very beautiful Praia Carvalhal and in the distance we could already imagine the Sierra da Arrábida near Lisbon. On the Pensinsula de Tróia we cycled to the ferry, which brought us to Setúbal accompanied by several dolphins. The industrial city turned little attractive and so we quickly made our way east to the Sierra da Arrábida. Over very nice route we climbed the serpentines in low traffic and rushed down again to Sesimbra, before we had to peddle everything up again the next morning. We drove to the Cabo Espichel with a large monastery, impressive cliffs and a beautiful lighthouse and then on to the Lago de Albufeira, which was only separated by a small strip of sand from the sea. About Caparica, which was difficult to reach over annoying detours for cyclists, we drove into the dense capital traffic. In Trafaria we took the ferry over the Rio Tejo directly to the Torre de Belém and moved to the campsite in the district of Montesanto. We had one more day to take a closer look at Lisbon and so we walked to the Elevador de Santa Justa, the picturesque old town of Alfama, the cathedral, Rossio and the Praca de Comercio, before the next day we set off on the bikes for 14 km Pedal up to the airport, collect some boxes there, pack our bikes and luggage and get ready for our return flight. Unfortunately, our time in Portugal was over!